Latest Generation of electronic antifouling technology. 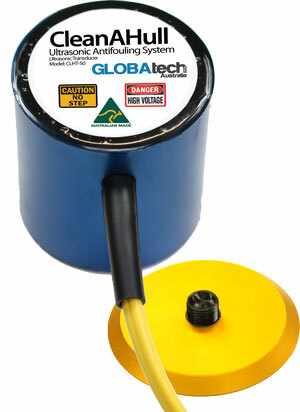 From over 10 years in research and development by Globatech Australia. CleanAHull Advanced Ultrasonic Antifouling system is the result of over 10 years of development in Ultrasonic Antifouling technology. Self calibrating system including our !BLAST! function. The CleanAHull marine growth prevention system(MGPS) outputs thousands of very specific frequencies via specially created algorithms. Our frequencies have been developed to damage or destroy various algae and bio fouling organisms for maximum protection. 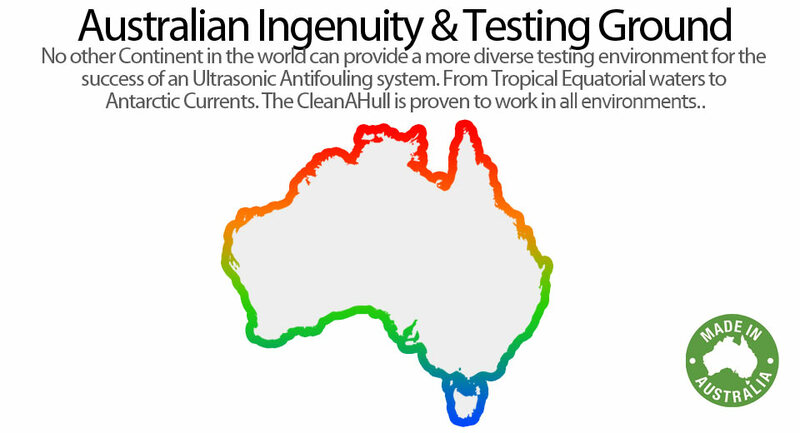 CleanAHull uses an advanced digital system to output precise frequencies thousands of times every second via the advanced CleanAHull Transducers. 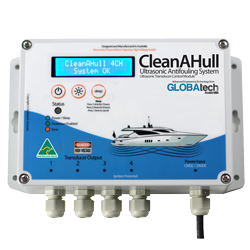 The CleanAHull Ultrasonic Antifouling system is a zero configuration device. It will automatically calibrate at regular intervals to ensure the best protection. CleanAHull is a set and forget device. CleanAHull Ultrasonic Antifouling Systems automatically optimise for maximum protection, reading many internal sensors to adjust operation. CleanAHull will run directly from your 12VDC or 24VDC battery source, with no need to worry about power supplies or connecting high voltage AC in your boat. Built in cooling and temperature monitoring will increase the life expectancy of the CleanAHull electronics. Detailed information is shown on the LCD panel and the Multi coloured LED display outputs the status of the device for easy viewing. CleanAHull provides excellent protection, only consuming ~250-300mA per transducer on average. 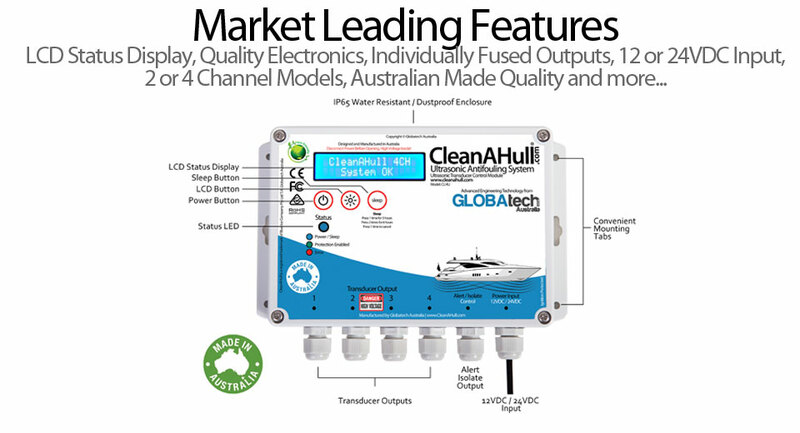 The CleanAHull Ultrasonic Antifouling system is designed and developed in Australia using quality components, including gold plated circuit boards and the best components available. All CleanAHull systems are independently tested and certified to FCC, RCM, C-Tick and CE by a NADA approved test agency for your added assurance. The CleanAHull Ultrasonic Antifouling System comes with an LCD panel built into the front which displays live information on. Shown on the LCD panel is the live Current, Battery Voltage, System Status, Internal Temperatures, The Status of the internal protection fuses. If there is any issues the LCD Panel will display a legible error status in plain english for troubleshooting. 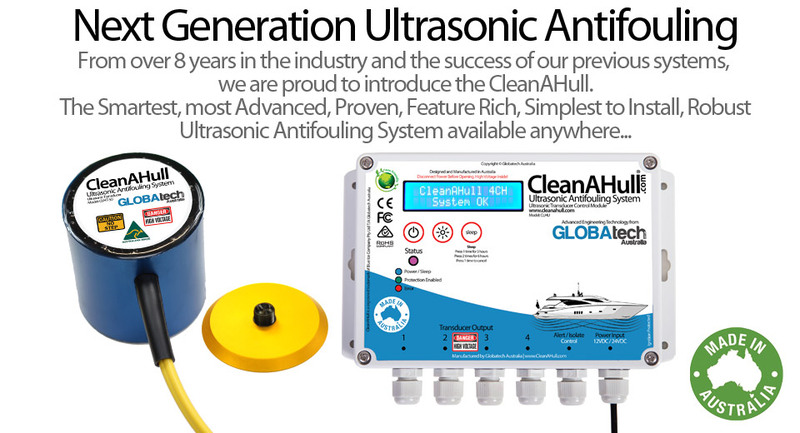 The CleanAHull Ultrasonic Antifouling System comes with an industry leading 3 year warranty! 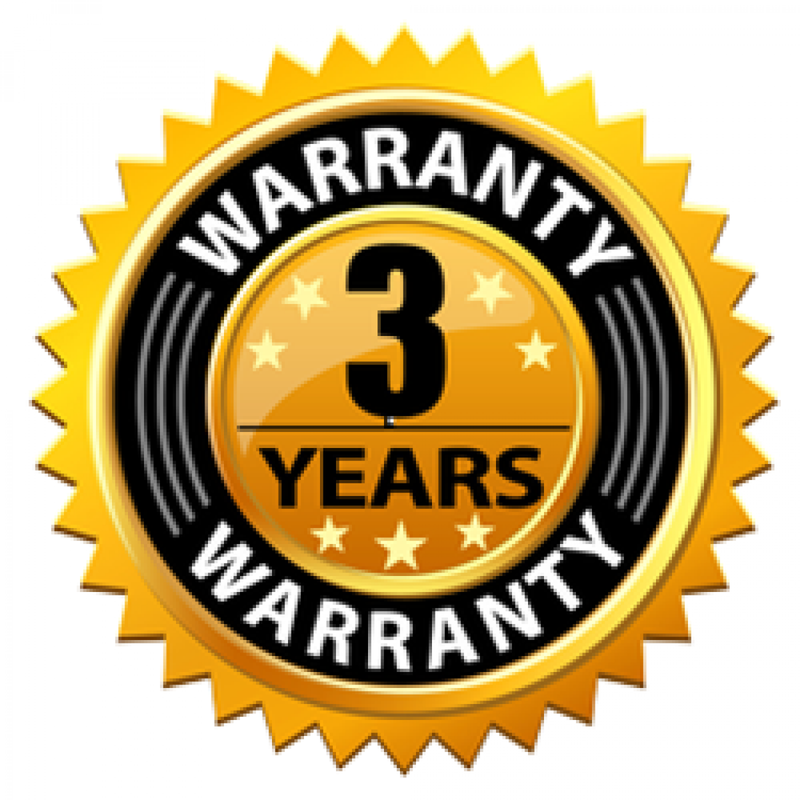 This unprecedented warranty is attributed to the high quality of Globatech Australia’s production. CleanAHull Systems are even produced on gold plated circuit boards to eliminate corrosion. All CleanAHull Ultrasonic Antifouling systems are produced in our advanced manufacturing laboratory in Australia to strict quality control standards and all warranty is dealt with in house for added assurance. Designed and engineered over many years of development the CleanAHull Transducer and mounting footprint provides the ultimate transference of the ultrasonic energy for ultimate protection. The mounting footprint also enables very simple installation. Transducers are encapsulated with advanced and robust urethane resin within their Anodised Aluminium outer shell for added protection and resilience. CleanAHull Transducers are robust and IP68 rated. Low profile transducer design allows for installation in some of the tightest environments like on transom shields or under floors and engines. Fixed cable design prevents unwanted damage to connectors. After years of development if was found the best way to prevent unwanted damage from mechanics or customers accidentally stepping on a transducer was the affix the cable directly and use a clever strengthening rubber sleeve on the transducer itself so no damage can occur. 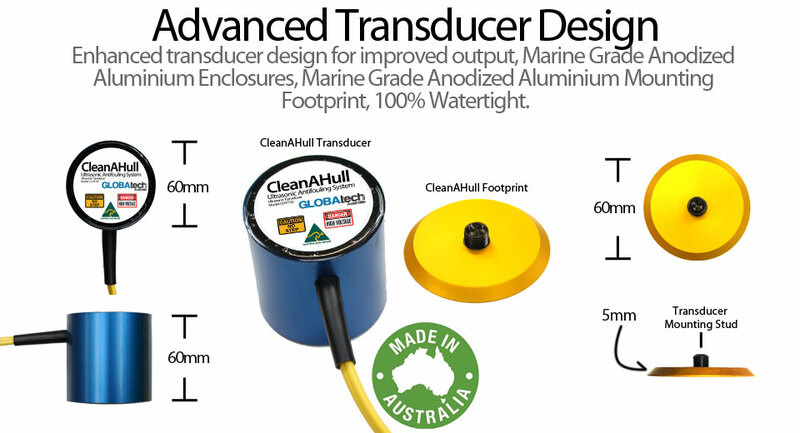 The CleanAHull transducers are developed specifically for Ultrasonic Antifouling and are the most effective transducers available providing up to 30% more output while not consuming any additional energy. To simplify installation and improve effectiveness the CleanAHull accepts 12VDC or 24VDC automatically. This means no expensive cabling, AC Power or the need for dual powering your system. All boats have a battery charge solution already installed, so why pay for another! The CleanAHull will simply power directly from your vessel battery and instantly provide protection. Our System boasts twice the output of the competition. Dual and Quad outputs available. Up to 20% Savings on running costs. A Clean Hull means reduced drag! This and the fact our units are the most affordable available is a winning combination. Our units are designed for safety. Temperature protection, Independant Output Control, Current Monitoring, Advanced Ferrite Filtration and more. 12VDC or 24VDC Input. Our system will automatically take either voltage and provide the same quality protection! Active Current, Output, Temperature, and more monitoring. With instant compensation and automatic variable output control. All while providing realtime information on the built-in LCD Display. The First Ultrasonic Antifouling system ever to offer Targeted Protection for Running Gear, Sea Strainers and more. Through the use of our Mini Transducer Technology..